In the days ahead, Alicia Gaudio will be visited by a woman she has never met to receive a gift she wishes she wouldn’t need. Nicole Rowe, holding the wig she wore during cancer treatment, with her husband Michael, daughter Jordan and son Alex. She is giving the wig to Alicia Gaudio. Ms. Gaudio, who is 23 weeks pregnant, learned two weeks ago that she has breast cancer. On Thursday, the 40-year-old attorney from Mt. Kisco, N.Y., underwent a mastectomy, which will be followed by chemotherapy. The gift—a stylish brown wig—is intended to help her return to good health. 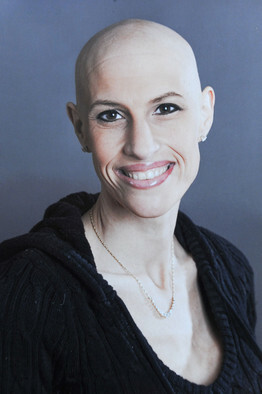 It will be delivered by Nicole Rowe, who wore it after she lost her own hair during breast cancer treatment last year. “We call this the healing wig,” Ms. Rowe, an optician, plans to tell Ms. Gaudio. 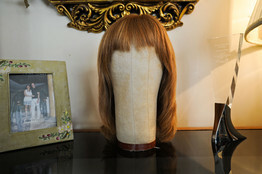 The ‘healing wig’ worn by Nicole Rowe when she lost her hair amid chemotherapy treatments. Now, the wig is being sent to another woman who will be receiving breast-cancer treatments. While such old-fashioned superstitions continue to resonate, people today also find meaning in less-traditional talismans. San Francisco Giants first baseman Aubrey Huff has gotten attention for wearing a red, rhinestone-trimmed thong under his uniform, which he believes helped his team make it to the 2010 World Series. Thirteen California women made news a few years ago when they purchased a $37,000 diamond necklace together and took turns wearing it. Each agreed to make love at least once with it on. The women said the necklace bonded them and helped change their lives. Meanwhile, a recent book, “Three Wishes,” tells the true story of Carey Goldberg, a single woman who at age 38 decided to find an anonymous sperm donor. Shortly after buying eight vials of sperm for $175 each, she fell in love with the man who would become her husband; they conceived a child naturally. She passed the vials on to Beth Jones, who also ended up falling in love, having a child, and never using the vials. The vials were then passed on to Pamela Ferdinand, who proceeded to fall in love and have a child naturally. It’s often assumed that unsophisticated people are most likely to be drawn to talismans, but intellectuals and corporate titans are drawn to them, too, says Dr. Sandage. In some communities, efforts are under way to get older people to talk about their personal amulets before it’s too late. The Boston-based Keepsakes Project, for instance, invites senior citizens to be videotaped telling personal stories about their keepsakes. The videos are shown on local cable television. As the world changes, and we age, material objects that we find meaningful remain the same, says Susan Bosak, chair of The Legacy Project, an educational organization that connects generations. Older people struggling with dementia can use talismans to recall happier memories. The objects trigger connections in their brain that can’t otherwise be accessed. 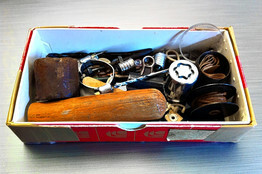 Scott Sandage These items—including a clamp, bolt and drill bits—were among the few belongings Scott Sandage’s father brought with him when he moved into a nursing home. After his father’s death, Dr. Sandage, held on to the items, drawing comfort from their connection with his family. In that spirit, “the healing wig” offers a shared strength, and a path back to health, say the women who’ve worn it. Before she passes the wig on to Ms. Gaudio, Ms. Rowe will have it washed and blow-dried at a salon near her home in Salisbury Mills, N.Y. She plans to encourage Ms. Gaudio by telling her that the three women who’ve already worn the wig are now well. She’ll also share a story. The wig’s magic reaches beyond those who’ve worn it, Ms. Rowe says. It helped her little boy imagine the possibilities of spring. This entry was posted in Breast Cancer and tagged Breast Cancer, Featured, healing wig, Jeffrey Zaslow, lucky charm, Wall Street Journal, wig. ← Hello November, Goodbye October. Good luck and thanks for the great article.I will are available back again. This is a awesome post and I definitely agree, you have a great blog in general. I will certainlycome back to read more one day.